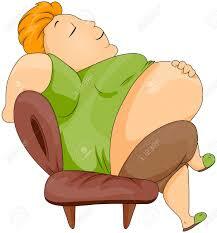 Overeating is the process of eating excess food in relation to the energy expended by a person. There are a thousand and one scientific explanations that is given to what happens before, during and after overeating. I want to explain overeating as it relates to me. I mostly have this experience when I think I am too hungry or when I enjoy the meal or when the food is my favorite. I think as much as it is easy to explain overeating, it starts from the mind then the mouth and the most effect is felt in the stomach then the waist in that order. Overeating is a habit one may not be able to sever from completely, since we were kids it was normal to be rewarded with food. In fact, in this part of the world, you are even punished for not eating or becoming a picky eater and when you are slim/fit it's like you are battling with hunger and impoverished, all these for someone like me informed the tendency to overeat. It is normal to overeat once a while but when it becomes a security from life's bellows, then help is needed. I usually overeat foods that I love but since I started this weight loss journey, I have learnt to create space and time for such foods. One good example is white bread, if I eat bread as breakfast then I will have to create a deficit with the remaining food for the day depending on my calorie needs for a day. If bread will be my dinner, then I create enough space in my caloric range during the day. The greatest effect of constant overeating is excess weight, because it means you are not generating enough energy to expend what your body has converted in your body and the implications of that is that you start storing fat in some places determined by your body build and genes, hence the weight gain. 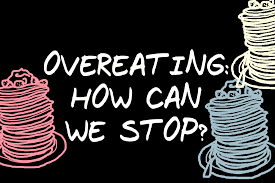 Since the onset of weekly 5:2 diet plan of intermittent fasting, I realized that episodes of overeating now comes with some painful/unbearable constipation, like it's happening to me right now. I took a heavy breakfast and I have felt uncomfortable for the better part of today, I had walked around, took some mint, took lots of water but I am still filled with gas right now. That is a great warning for me when next I am eating what I love, easy babe easy. Seek help. It can be hard to stop overeating on your own, particularly if there are deep-rooted emotional problems involved, says Robin B. Kanarek, PhD, professor of psychology at Tufts University. Working with a counselor can help you uncover the psychological triggers -- like a negative body image -- that may be driving your behavior. Take a pause. When you feel like eating, pause for a moment and ask yourself: Am I hungry? “Sometimes people get so focused on what they want to eat that they don’t stop and ask themselves why they want to eat,” May says. If you use food as a coping tool, you may be out of touch with the cues that signal hunger or fullness, and it’s important to bring your awareness back to your body. Give into cravings -- in moderation. Banning foods can cause you to overeat them later on. If you’re really craving something -- even if you’re not hungry -- give yourself permission to have a small amount. I weighed in at 164.2lbs this morning as against 166lbs last Wednesday. I am happy with my choices right now as per food and exercise. Working out is not easy but it is simply worth it and I am doing well. May it be consistent, Amen.